I took yesterday off for traveling. After years of having little to no time off for Thanksgiving and Christmas, I’m making the most of the freedom this year! This week I’m working from my home state of Mississippi – and I couldn’t be happier about it. However, my brother, sister, their spouses and my nephew arrive tomorrow and I have a sneaking suspicion that I won’t be getting a lot of work done. I saw this today and thought it was a creative twist on the more traditional “cocoa/cake mix in a jar” gift idea. 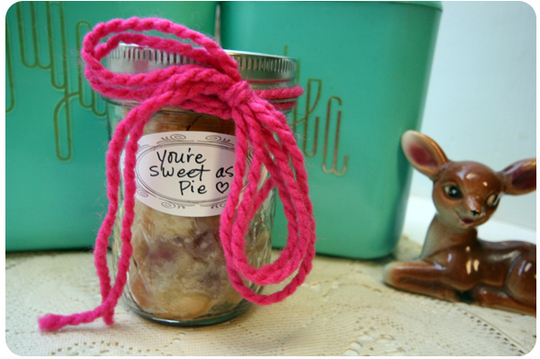 It’s a pie – baked right into the mason jar! I love, love this idea for hostess gifts or for adding a sweet little treat to a larger gift. They would even make wonderful favors at a party you’re hosting. I’m not sure who I’ll be making these for this season, but you can bet that I will!